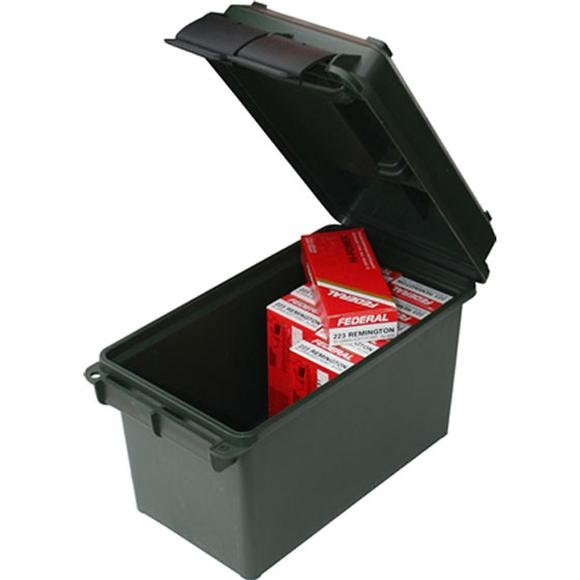 MTM ammo cans are a great way to store bulk or boxed ammo. Its all plastic design is lighter in weight than the 50 caliber US Military Surplus Ammo Can. Transferring ammo to and from the range, just became a little easier! Ideal for ammo storage. Molded out of rugged polypropylene plastic, these comfortably handled ammo cans will hold up to some pretty harsh treatment. MTM ammo cans are a great way to store bulk or boxed ammo. Its all plastic design is lighter in weight than the 50 caliber US Military Surplus Ammo Can. Transferring ammo to and from the range, just became a little easier! Ideal for ammo storage. Molded out of rugged polypropylene plastic, these comfortably handled ammo cans will hold up to some pretty harsh treatment. Utilizing MTM&apos;s tongue and groove O-Ring seal system for a superior water-resistant seal, the 50 cal can is designed to fit the same amount of bulk ammo storage as the original. A heavy-duty dual latching system makes for a better seal and less likely to open accidentally. Double padlock tabs along with molded-in stacking ridges, make these solid containers the perfect solution to so many storage needs. Designed to hold up to 25 pounds of ammo or gear! Measurements 7.4" x 13.5" x 8.5", Inside: 5.8" x 11.0" x 7.2"